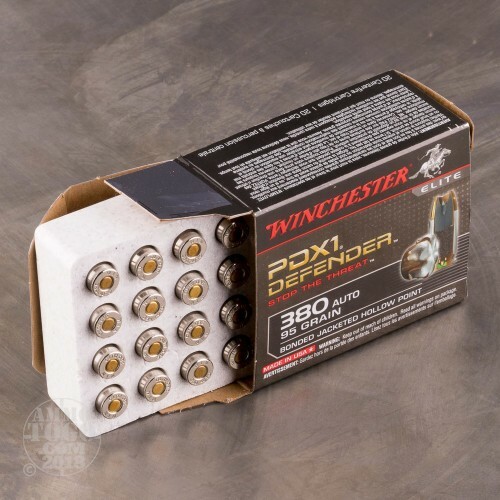 This 380 Auto cartridge by Winchester showcases its American manufacturer’s state of the art PDX1 projectile. 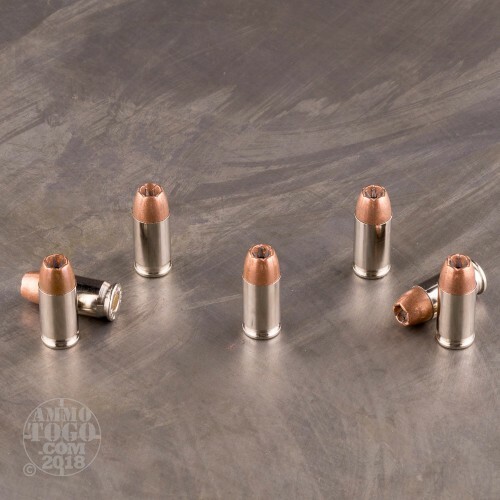 The bullet is designed to surpass the FBI’s test protocol for barrier penetration, and as the result is a highly dependable solution for self-defense when you can’t be certain what’s going to be separating you from your attacker. The PDX1 manages this because its core and jacket have been united via a proprietary bonding process, rendering them virtually incapable of separating from one another as they plow through glass, wood, steel, and fabric alike. This round’s bullet doesn’t only retain its weight as it burrows deeply within its target. Its jacket further sports six uniform notches, ensuring that it produces just as many sharp cutting petals as the bullet widens up to 1.5 times its original diameter. This round’s reliability is boosted even more by its nickel plated brass casing, which cycles effortlessly through a semi-automatic and is furthermore highly resistant to tarnishing. If you’re ever assaulted in the dark, you will appreciate how this round’s propellant is formulated to emit only very little flash when ignited. That will preserve your vision so that you may fire rapid and accurate follow-up shots. 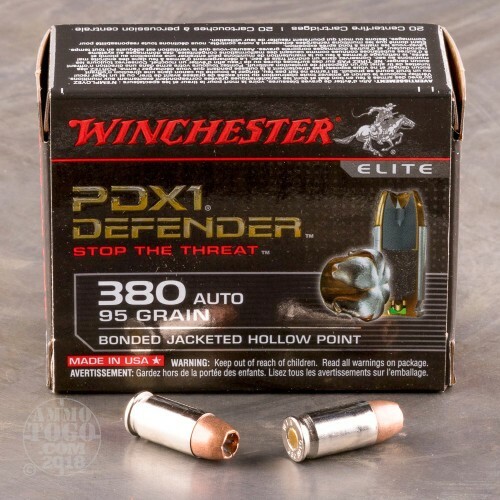 In hopes of giving ourselves and our customers a better idea how this 380 Auto (ACP) self-defense ammo would perform if called upon in a self-defense scenario, we tested dozens of the best selling hollow points on the market. 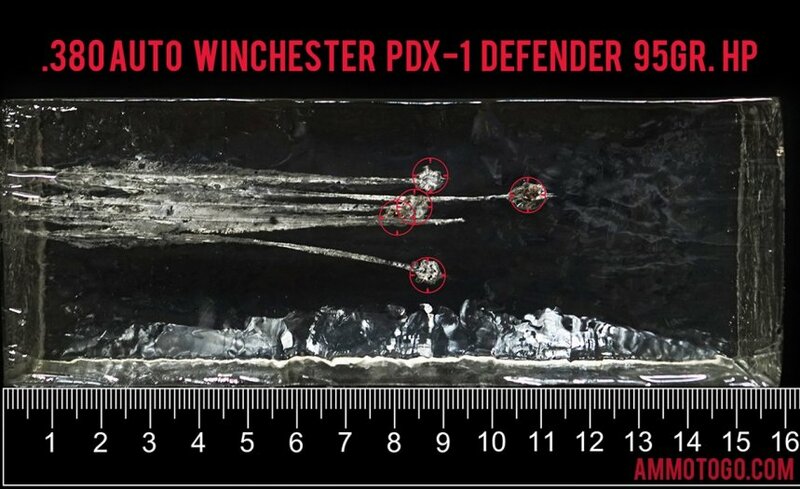 We fired five rounds of this Winchester Ammunition 380 Auto (ACP) ammo through a cloth barrier into Clear Ballistics calibrated synthetic gelatin and recorded the results. For these tests, we used a Ruger LCPII with a 2.75-inch barrel. In the photos, graphics and video on this page, you can see specifically how the Winchester Ammunition ammo performed and how it sticks up with the rest of the 380 Auto (ACP) ammo we have tested so far. 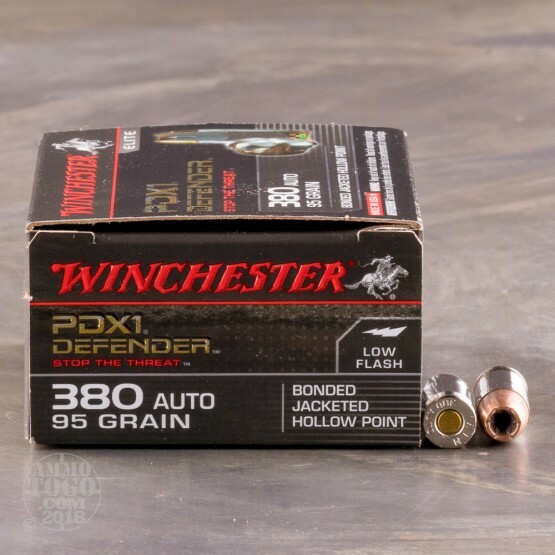 How do the results for this Winchester Ammunition 380 Auto (ACP) compare to other 380 AUTO? Expansion Diameter Compared to All 380 Auto (ACP) Ammo Tested MIN 0.35" MEDIAN 0.355" THIS AMMO 0.61" U.S. dime MAX 0.78"
Penetration Depth Compared to 380 Auto (ACP) Tested 0" 10" 20" 30" MIN 6.5" MEDIAN 13.3" THIS AMMO 9.3" MAX 28.7"